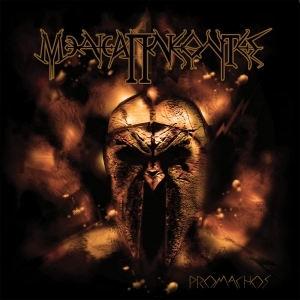 Meneapneontes are a young project from the capital city of Greece, Athens, formed in 2011 and consisting of Vasilis Karogiannis (vocals & bass guitars) and Takis Boutsalis (guitars). With assistance of session drummer John Athanasiou and guest guitar player Harris V., the duo recorded, mixed and mastered all material at the Eleventh Tower Studios (located in the historic city of Piraeus), and the result gets released by Russia’s Satanath Records, this time in collaboration with Italy’s Murdher Records. Promachos, the band’s debut, consists of eleven pieces, and it lasts for just over fifty minutes. What these guys bring is a highly rhythmic, melodic and energetic form of Modern Extreme Groove Metal, including quite some angles from Symphonic Power / Traditional Heavy / Epic Death, Traditional Thrash and, especially, Melodic Black Metal, with hints of Folk / Viking / Pagan stuff. In general, it’s quite catchy and in one way or another undeniably Greek in song writing, performance and sound. Actually, Promachos is quite an enjoyable album to listen at, especially because of a huge dose on variation. It’s not a release that gets based on introspection, philosophy or deep-thought questions of Life and Death, but it brings quite a pleasant form of joy-of-play. Besides, a couple of tracks are almost outstanding, such as the epos Alexandros, a.o.